Plate six from HH Wilson's 'The Oriental Portfolio'. Wilson describes the town shortly after its capture by the British in 1804: "Deeg possessed a considerable population and could boast many large edifices belonging to persons of rank, besides the palace of the Raja, which was then a spacious and handsome structure. 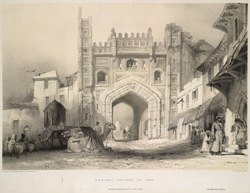 It had, however, declined from its former prosperity ... Amongst its remains are some of reputed sanctity and amid the general solitude and decay, the gay and nosy encampment of a Mohammedan pilgrim of rank makes it occasional appearance. There are many beautiful specimens of its formal grandeur. The gateway shown in the plate is situated on the northern side of the fortress, and was formerly the entrance to a spacious Serai, which is now a heap of ruins. The towers on either side of the arch appear to be falling asunder, and the building is in many places riven in broad apertures, through which the rains find a thousand channels."